This article is about a vehicle for interstellar travel. For other uses, see Starship (disambiguation). A starship, starcraft or interstellar spacecraft is a theoretical spacecraft designed for traveling between planetary systems, as opposed to an aerospace-vehicle designed for orbital spaceflight or interplanetary travel. The term is mostly found in science fiction, because such craft is not known to have ever been constructed. Reference to a "star-ship" appears as early as 1882 in Oahspe: A New Bible (1882). Whilst the Voyager and Pioneer probes have travelled into local interstellar space, the purpose of these uncrewed craft was specifically interplanetary and they are not predicted to reach another star system (although Voyager 1 will travel to within 1.7 light years of Gliese 445 in approximately 40,000 years.) Several preliminary designs for starships have been undertaken through exploratory engineering, using feasibility studies with modern technology or technology thought likely to be available in the near future. In April 2016, scientists announced Breakthrough Starshot, a Breakthrough Initiatives program, to develop a proof-of-concept fleet of small centimeter-sized light sail spacecraft, named StarChip, capable of making the journey to Alpha Centauri, the nearest extrasolar star system, at speeds of 20% and 15% of the speed of light, taking between 20 and 30 years to reach the star system, respectively, and about 4 years to notify Earth of a successful arrival. On November 8, 2018, Elon Musk announced that SpaceX was renaming the Big Falcon Rocket, a fully reusable launch vehicle and spacecraft system, to Starship. Though the spacecraft will not possess any reasonable interstellar capability, Musk defended the name by claiming that "later versions will." To travel between stars in a reasonable time using rocket-like technology requires very high effective exhaust velocity jet, and enormous energy to power this, such as might be provided by fusion power or antimatter. 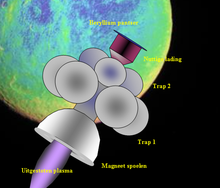 The Bussard ramjet is an idea to use nuclear fusion of interstellar gas to provide propulsion. Examined in an October 1973 issue of Analog, the Enzmann Starship proposed using a 12,000 ton ball of frozen deuterium to power thermonuclear powered pulse propulsion units. Twice as long as the Empire State Building and assembled in-orbit, the proposed spacecraft would be part of a larger project preceded by interstellar probes and telescopic observation of target star systems. The NASA Breakthrough Propulsion Physics Program (1996–2002), was a professional scientific study examining advanced spacecraft propulsion systems. Sleeper, which put their passengers into stasis during a long trip. This includes Cryonics-based systems that freeze passengers for the duration of the journey. Generation, where the destination will be reached by descendants of the original passengers. Relativistic, taking advantage of time dilation at close-to-light-speeds, so long trips will seem much shorter (but still take the same amount of time for outside observers). Faster-than-light, which can move between places very quickly (transcending current understanding of physics or using interdimensional 'shortcuts' or wormholes). Certain common elements are found in most fiction that discusses starships. Fiction that discusses slower-than-light starships is relatively rare, since the time scales are so long. Instead of describing the interaction with the outside world, those fictions tend to focus on setting the whole story within the world of the (often very large) starship during its long travels. Sometimes the starship is a world, in perception or reality. Travel at velocities greater than the speed of light is impossible according to the known laws of physics, although apparent FTL is not excluded by general relativity. The Alcubierre drive provides a theoretical way of achieving FTL, although it requires negative mass, which has not yet been discovered. Nevertheless, Harold G. White at NASA has designed the White–Juday warp-field interferometer to detect a microscopic instance of a warping of space-time according to the Alcubierre drive. The following is a listing of some of the most widely known vessels in various science fiction franchises. The most prominent cultural use and one of the earliest common uses of the term starship was in Star Trek: The Original Series. ^ Erik Sofge (20 September 2012). "What Would a Actually Look Like?". Popularmechanics. Retrieved 9 April 2016. ^ "Oahspe - Index". gailallen.com. ^ "Oahspe - Book of Divinity: Chapter XVI". gailallen.com. ^ "Voyager 1 Has Date with a Star in 40,000 Years". Space.com. ^ Overbye, Dennis (12 April 2016). "A Visionary Project Aims for Alpha Centauri, a Star 4.37 Light-Years Away". New York Times. Retrieved 12 April 2016. ^ Stone, Maddie (12 April 2016). "Stephen Hawking and a Russian Billionaire Want to Build an Interstellar Starship". Gizmodo. Retrieved 12 April 2016. ^ Staff (12 April 2016). "Breakthrough Starshot". Breakthrough Initiatives. Retrieved 12 April 2016. ^ Elon Musk [@elonmusk] (November 19, 2018). "Renaming BFR to Starship" (Tweet) – via Twitter. ^ Elon Musk [@elonmusk] (November 19, 2018). "Later versions will" (Tweet). Archived from the original on November 21, 2018 – via Twitter.